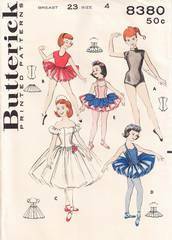 Original vintage 1950's sewing pattern for set of dancing costumes. Included are short leotards, scoop neck leotard, practice skirt, ballerina length ballet costume and crown, classical ballet costume and petal decorated tu-tu. Girls' Size 4, Breast 23, Waist 21, Hip 24. Pattern is used and complete. Several of the pieces have been meticulously cut. The envelope and contents are all in very good, well preserved condition.